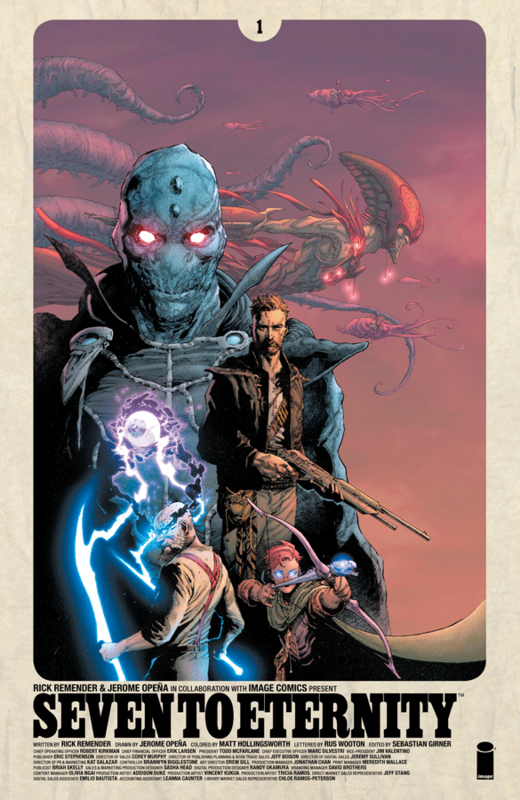 Image Comics reports that, in order to keep up with overwhelming customer demand, it is sending SEVEN TO ETERNITY #1, written by Rick Remender, drawn by Jerome Opeña, and colored by Matt Hollingsworth, back for a second printing on the same day as the issue’s release. And that makes total sense. This is the just the sort of quirky, weird, action-packed comic that will excite many readers. This is the tale of Adam Osidis, one reluctant hero confronting, The Mud King, one scary evil ruler. Both characters are up for a fight–or perhaps a discreet understanding of some sort. Welcome to the kingdom of Zhal, ruled by The Mud King, officially known as The God of Whispers. How this works is left sort of mysterious. Part of it has to do with The Mud King having cast a spell on all of the kingdom’s inhabitants. Much weighs upon whether or not someone will take up The Mud King’s offer, whatever that may be. Under no circumstances would Adam’s father bend his knee and accept any offer from The Mud King. That did not work out so well for Zebadiah Osidis. There is a whole village in exile hiding in the mountains because of Zebadiah Osidis’s defiance. So, maybe Adam can figure something out. This is definitely one of those big deal titles right up there with the likes of Jonathan Hickman’s celebrated Image Comics series, EAST OF WEST. This new breakout hit reunites the creative team behind Uncanny X-Force. You have all the depth and texture of a story you can really sink your teeth into. There is so much referred to and implied here to keep a series roaring for years. That said, we have a steady and compelling narrative unfolding. We’re in good hands with Adam, our reluctant yet cunning young hero. SEVEN TO ETERNITY #1 is available as of September 21st. For more details, visit Image Comics right here. That is one seriously awesome cover. Yes, a most distinctive cover!